Reason to Join a Local CGOA Chapter #5: Field Trips! 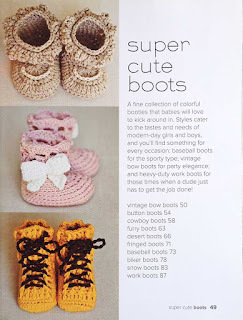 Post by Stacy Vaka of Crochet Kitten. 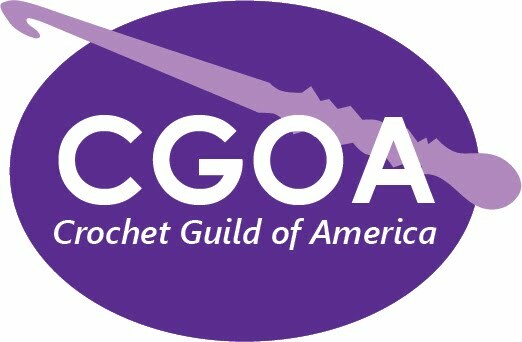 Welcome back to my blog series on what it's like to join a local CGOA chapter! I joined the Prince William County chapter of CGOA back in January, and I've been writing about what the experience has been like. You can find links to the whole series on this post. This month I had the opportunity to take part in one of the benefits I've been looking most forward to since I heard the year's agenda laid out in January, and that was a crochet field trip! In the past, my particular chapter has talked of making group trips to the Maryland Sheep and Wool Festival and the Knit & Crochet Show (and indeed, two of our members attended the Knit & Crochet Show this year and gave us the insider details at this month's guild meeting), but the field trip I partook in this month was to Bonita Yarns in Essex, Maryland to meet and have a workshop with Lianka Azulay, inventor of the crocodile stitch. Lianka with her mother Rachel's adorable pup. One of the fun things about visiting a crochet designer in her own element was having the opportunity to see the designer's own crochet handiwork in person. We've all seen the crocodile stitch dragon and mermaid patterns (even I'm guilty of these obvious applications with my Sirens of Atlantis and Angel Wings patterns), but Lianka's abilities speak to more versatility than that. 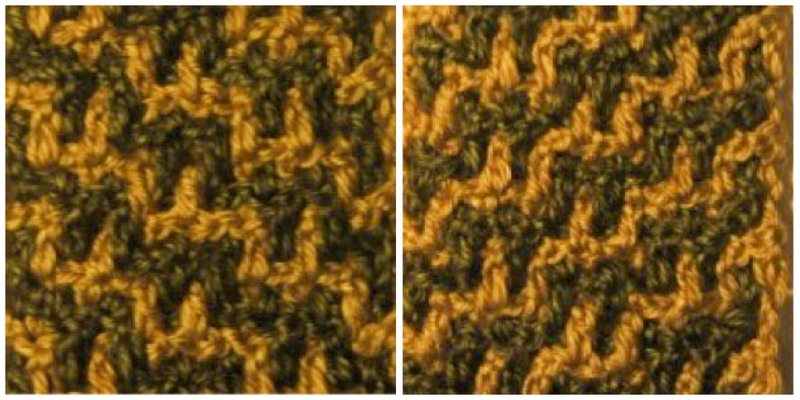 Did you know crocodile stitch could be this beautiful? Welcome back to the Layers of Texture Infinity Scarf Crochet-a-Long! You can get all the information about the CAL, including a complete schedule and links to previous posts, here. 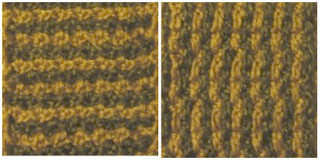 You can get the stitch pattern for Part 2: Divider Rows and Horizontal and Vertical Stitch here on Underground Crafter. Or, watch the video below. Join in the crochet-a-long and share your progress with other crocheters. Get more information about this crochet-a-long here. Stop by our Ravelry group or Facebook group to chat or ask questions. We can’t wait to see what you come up with! Ravelry members can also add the pattern to your Ravelry queue or favorites. Share your progress on social media with hashtag #cgoasummercal. You can get the stitch pattern for Part 1: Getting Started and the Staircase Stitch here on Underground Crafter. Or, watch the video below. Please note the written stitch pattern for Part 1 has been updated and corrected. 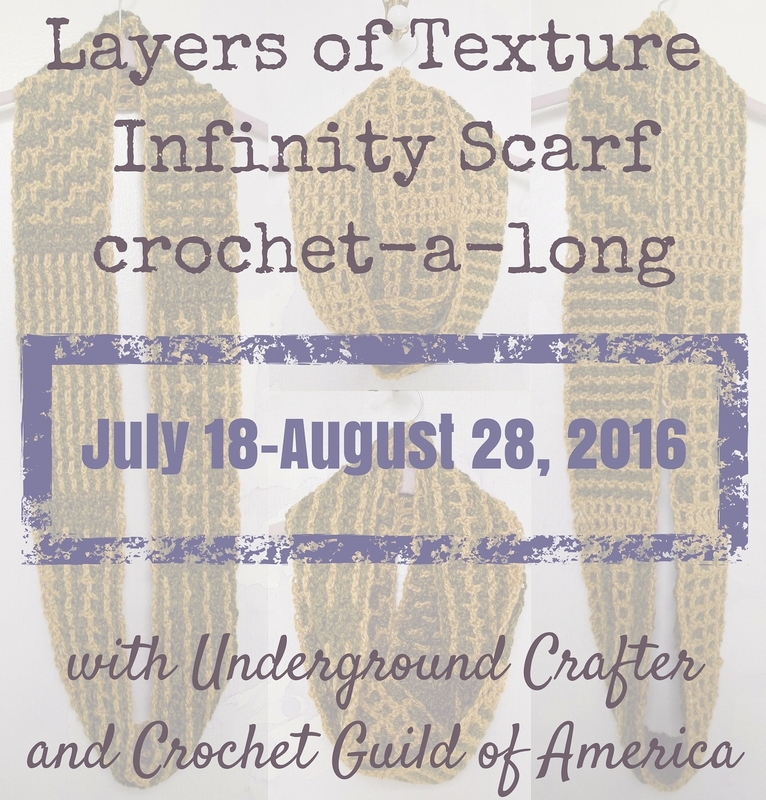 Everyone had so much fun with our Across the Board crochet-a-long that we've decided to host another! 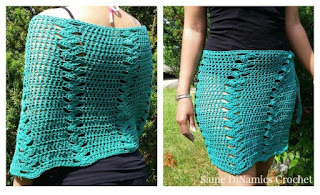 Like our last CAL, our summer crochet-a-long features a pattern designed by a CGOA member - me! You may know me as the host of the monthly CGOA member spotlight series, but I'm also a crochet (and knitting) designer and the blogger behind Underground Crafter. I've been holding onto this pattern for a while, waiting for just the right time to share it! Let me tell you about more about it and the crochet-a-long. Explore intermeshing crochet (also known as interlocking crochet or double filet crochet) by making this reversible sampler infinity cowl. 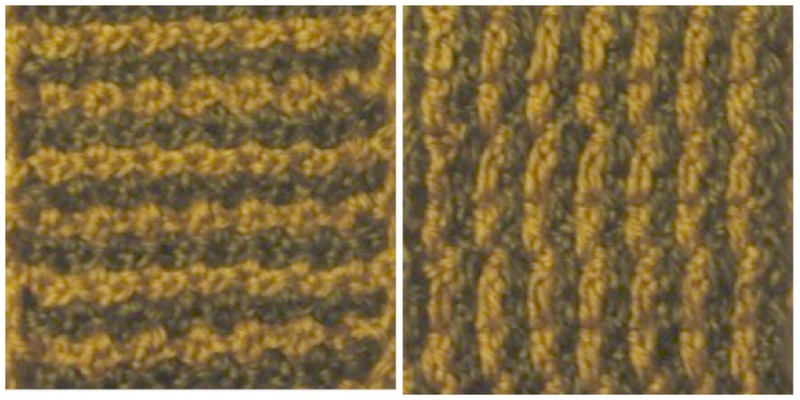 The pattern includes 6 different stitch patterns. 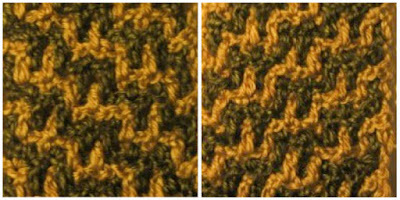 Intermeshing crochet seems hard at first, but once you get the hang of it, you’ll be happy you tried it! 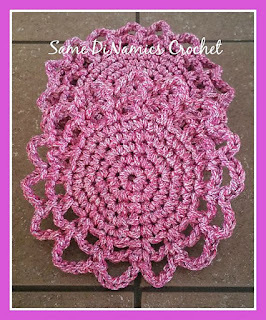 You need only basic crochet skills since intermeshing crochet uses just chains and double crochet stitches. This unisex project is a great way to get a head start on your own fall accessories or holiday gift-making, or to make something special to donate to charity. This pattern will be released in 6 parts. 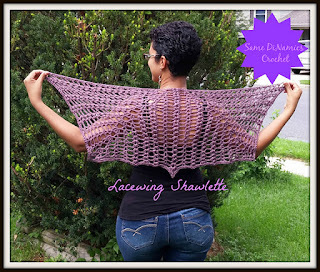 Each section will include both a written pattern and a video tutorial to help you as you make your first (or latest) intermeshing crochet project. You can crochet on your own, but isn't it more fun chat with other crocheters? Here is our CAL schedule. As each new part is released, this page will be updated to include links. We'll be sharing more details about giveaway prizes in an upcoming post. Until then, if you'd like to join in, let us know on Ravelry or Facebook. Share your progress with hashtag #cgoasummercal. You are welcome to use the button below to spread the word! Link back to this post so other crocheters can join in. We're looking forward to crocheting with you. Thanks so much to the rest of the CGOA Now! blogger team for their support, especially Stitches'N'Scraps for finding giveaway sponsors and Art, Like Bread, Crochet Kitten, and Jessie At Home for sharing ideas. P.S. : You can find more details about the supply list and how to choose yarns for this project in this video. 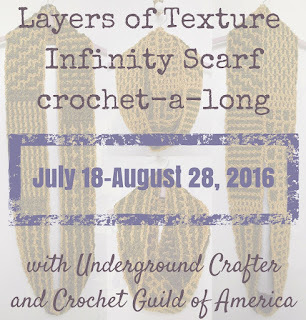 I'm Marie Segares from Underground Crafter and this is the seventh post in my monthly series on CGOA Now! where I shine a spotlight on a CGOA member and tell her story with an interview. This month's interview is with Dianne Hunt from Same DiNamics Crochet. Dianne is a stay-at-home-mom to 3 boys. When she was 35, she founded Same DiNamics to have something to call her own. Soon, she started selling her crochet work and later, she began designing. 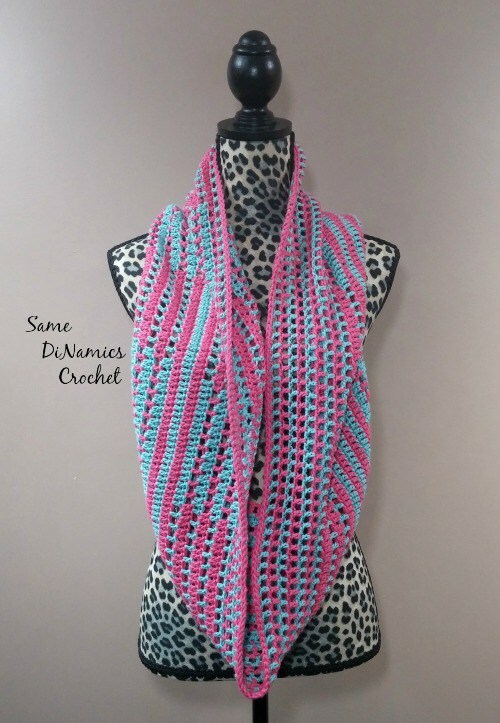 You can find Dianne at Same DiNamics Crochet, or follow her on Craftsy, Facebook, G+, Instagram, Pinterest, Ravelry, and Twitter. All images are used with permission and are © Dianne Hunt/Same DiNamics Crochet. Aeris Buttoned Cowl, free crochet pattern by Same DiNamics Crochet. Underground Crafter (UC): How did you first get started crocheting? Dianne: As a child, I was exposed to crocheting through my mom. She crocheted doilies when I was younger. I've always known how to do a simple chain and nothing more. I'd try doing more but it never clicked. However, it wasn't until about 2013 that I started crocheting with love and joy. I don't know what exactly it was that made it all clear to me. I started crocheting like I've been crocheting all my life, and I've enjoyed it every since. It's like my fingers were meant to crochet. Lacewing Shawlette, crochet pattern by Same DiNamics Crochet for sale on Ravelry. UC: When did you start designing? 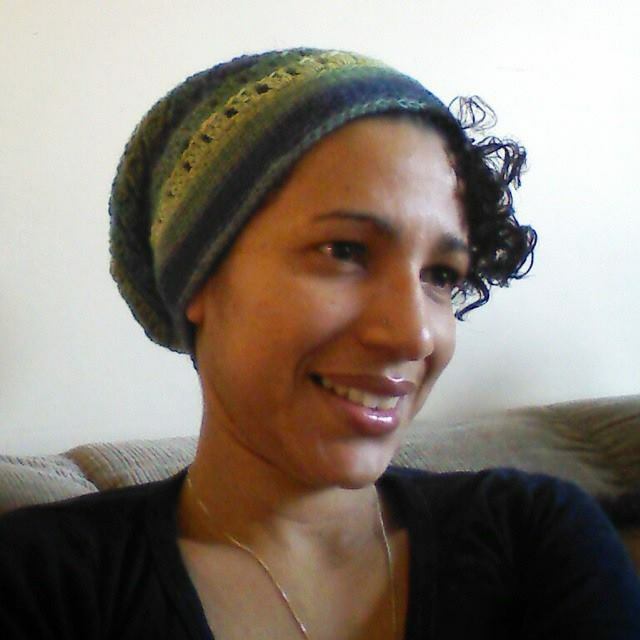 Dianne: I started designing in 2015 when I became a contributor to Cre8tion Crochet. (UC comment: You can read the interview with Lorene from Cre8tion Crochet here.) Before then, I'd done two simple designs but I didn't consider myself a designer. I'm still learning about designing and how to combine stitches to make fun and interesting designs. I've still got a way to go in my designing journey and I can't wait! 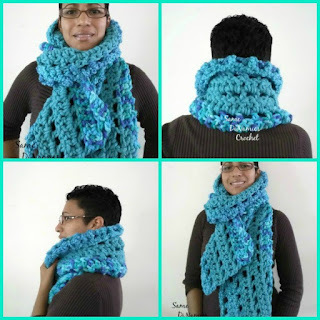 Super Chunky Super Warm Scarf, free crochet pattern by Same DiNamics Crochet. UC: How long have you been a member of the CGOA? What’s your favorite thing about being a member? Dianne: I became a member in January of 2016. This was one of my goals for the year. So far, the benefit of the exclusive newsletter is one of the things I like about being a member. 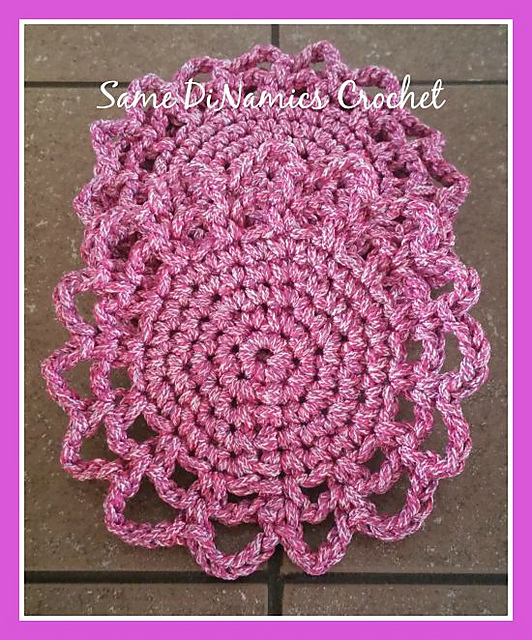 Raspberry Burst Coaster, free crochet pattern by Same DiNamics Crochet. UC: On your blog you talk about balancing your time between two passions (reading and crochet) as well as with being a stay-at-home mom. What are some favorite crochet books that you've read? Dianne: I read mainly fiction in most genres. I've read cozy mysteries that center around crafts but have yet to read one about crochet. Not good! Now, as far as non-fiction crochet books go, I recently read The Crocheter's Skill Building Workshop by Dora Ohrenstein and I have to say that one is perhaps my favorite. It's a book that I'd recommend all crocheters, whether they are designers, hobbyists, or have a crochet related business. This book is filled with lots of necessary information that can answer questions or make things clearer to the crocheter. Candy Stripes Cowl, free crochet pattern by Same DiNamics Crochet. UC: What are your favorite types of crochet projects for relaxing? Dianne: I'd say cowls. I really like how quick they work up and enjoy wearing them. One of my latest cowl design is by far my favorite, the Candy Stripes Cowl. Face Scrubbies and Soap Pouch Spa Set, free crochet pattern by Same DiNamics Crochet. UC: What are your favorite types of crochet projects for challenging yourself? Dianne: Doilies... I enjoy making doilies that use a combination of stitches to make the project unique and extraordinary. I have several doily books that were passed down to me from my mom that are in Spanish. While I read and speak Spanish, translating the stitches from Spanish to English is challenging, so I make the doilies by looking at the stitch diagram available in the books. That's a challenge but the end results are beautiful. Wrapped in Stars Mug Cozy, free crochet pattern by Same DiNamics Crochet on Cre8tion Crochet. UC: What are your favorite types of crochet projects to give as gifts? Dianne: Simple projects that work up quickly are great gifts. 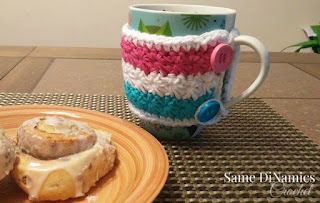 Mug cozies are wonderful; almost everyone drinks either coffee or tea and can use one. 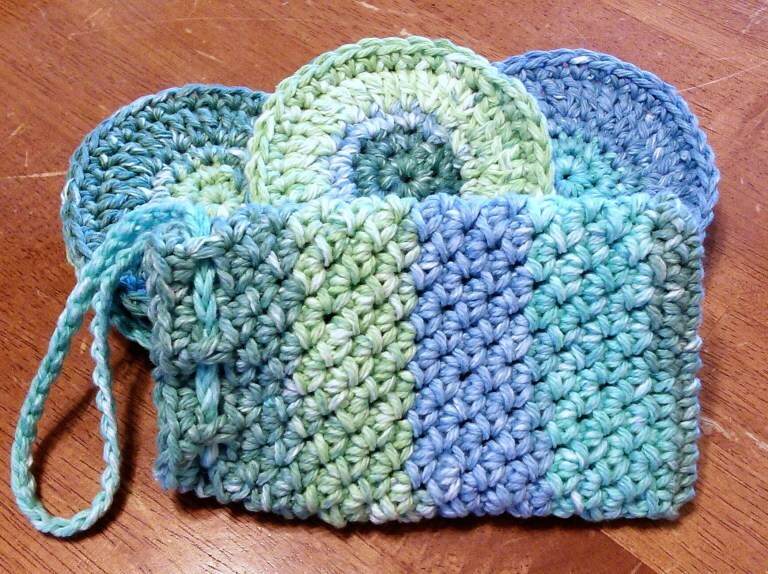 Spa sets and dishcloths are great, too; they will get used. Dreamcatcher's Anklet, free crochet pattern by Same DiNamics Crochet. UC: What are your favorite types of crochet projects for the summer months? Dianne: Simple things like spa sets for pampering. Also, beach skirts/wraps are fun to make because you can wear them to the beach, lake or poolside like the St. Croix Beach Wrap. 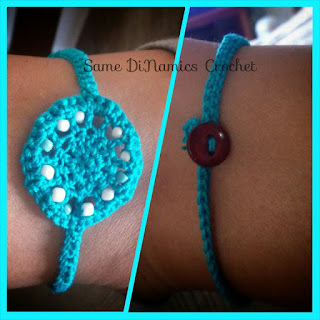 I also enjoy crocheted jewelry like the Dreamcatcher's Anklet, my first design. St. Croix Beach Wrap, free crochet pattern by Same DiNamics Crochet on Cre8tion Crochet. UC: What are you working on in 2016? What's next for you? Dianne: My main goal for 2016 is to continue adding designs to my repertoire. I'm publishing 2 patterns per month. Continuing to learn and grow in my craft by watching others and helping others. I also want to become self-hosted with my blog. Thanks, Dianne, for sharing your love of crochet with us! 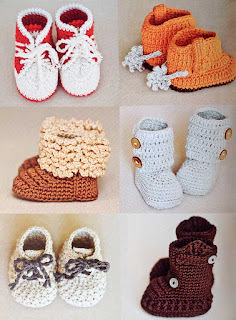 Very few things in the crochet world are cuter than little baby booties and shoes. They're also relatively fast and easy to make, so are great for last minute gifting. 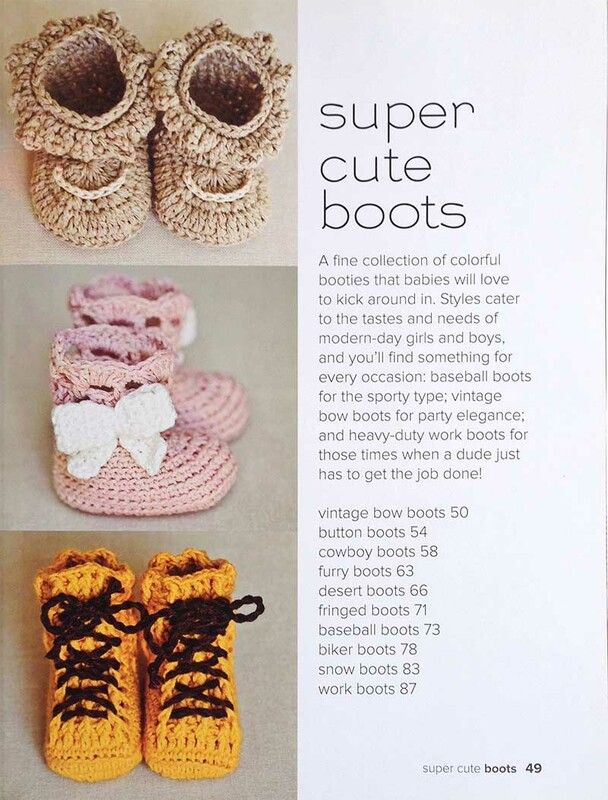 With 30 adorable designs, this book is a must have. Choose your favorite designs and build up your baby gift stash or craft fair inventory in no time. The patterns are divided into 3 sections: shoes, boots, and sandals. They are based on classic adult shoe styles like moccasins, work boots, and espadrilles. There's even a pair of cowboy boots, complete with spurs! Most of the designs are made in size 3 / DK weight yarns, though there are a few in other weights as well. 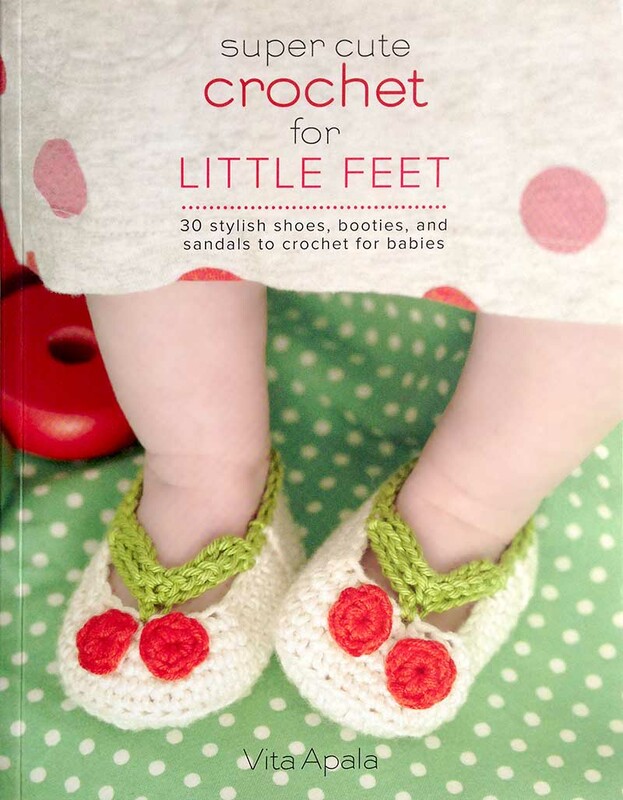 The book includes a "Crochet Basics" section with tips on tools and notions, as well as illustrated instructions for basic stitches. There's also a useful discussion of different sole treatments including double soles and non-slip finishes. As I said, this book is a must have....and you can win your own free copy! This giveaway prize is generously provided by the publisher, St Martin's Griffin. To be eligible, you must be 18 years of age or older, with a valid, US or Canadian shipping address. The winner will be contacted by email, and must reply to that email and provide the shipping address within 1 week in order to receive the prize. If the winner does not reply within 1 week, a new winner will be selected. The giveaway ends on 7/26/16. Hurry and enter below! Disclaimer: A free review copy of Super Cute Crochet for Little Feet was provided by St Martin's Griffin. Although I accept free products for review, I do not accept additional compensation, nor do I guarantee a positive review. My reviews are based entirely on my honest opinions. All images of copyrighted material are used with permission. Reason to Join a Local CGOA Chapter #4: Swap Meets! Has your yarn stash gotten so large that you're beginning to consider thinning it out? Or do you ever wish you could raid someone else's stash in hopes of finding a perfect new treasure you've never seen before? Your local CGOA chapter is the perfect venue for both of these scenarios! One of our guild officers recently inherited several boxes of crochet-related materials--I'm talking thread, hooks, patterns, yarn, cross-stitch materials, swatches, WIPS, and finished objects. Rather than take the unwanted items to the local thrift store, where their fate would be unknown and possibly under-appreciated, she had the perfect place to find eager recipients. And believe me, our guild members were delighted to look through everything, myself included. The biggest issue, of course, being trying to restrain ourselves from taking too much home. There were some vintage gems in there that you won't find in a store. Now I'm thinking about going through my own stash so I can bring some treasures to the next meeting. How Do You Show Love through Crochet? Happy July! Well, we made it through another month and now is a good time to pause and reflect. There have been a lot of disturbing news stories lately and that adds to the stress of our daily lives. Even though we are all individuals with different opinions and viewpoints, I hope we can all come together and unite for love. Love is the place of healing. If we feel love, we know we are not alone. Therefore, in July's Question of the Month, I want to ask you, "How do you show love through crochet?" It can be any kind of love you wish. It can be self love and self care, love for the community through service, love for your family and friends, love for a higher power if that speaks to you, or love for nature through your choices. It can even be love I haven't mentioned yet. I show love through crochet mostly by crocheting gifts for others. And that love multiplies when the recipient likes the gift and uses it. 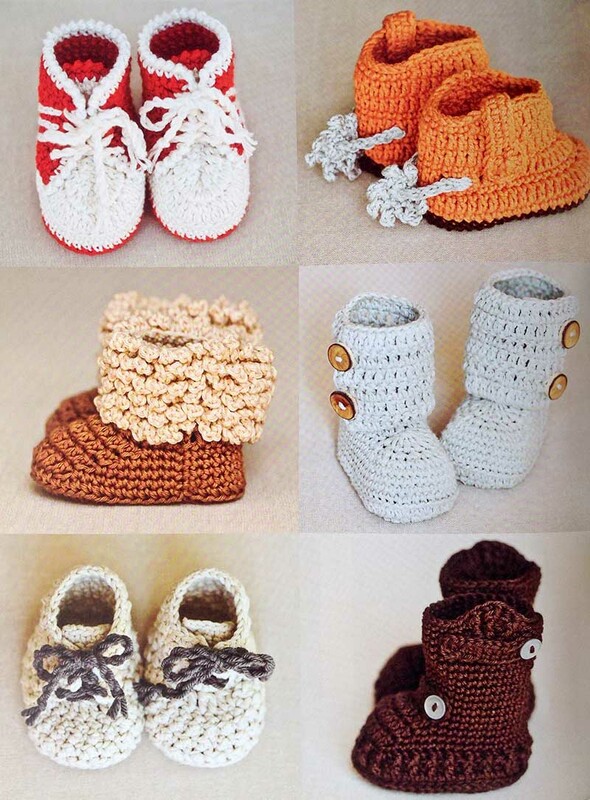 I find that since crochet is tactile and cuddly, the love and warmth is effectively conveyed. What about you? How do you show love through crochet? 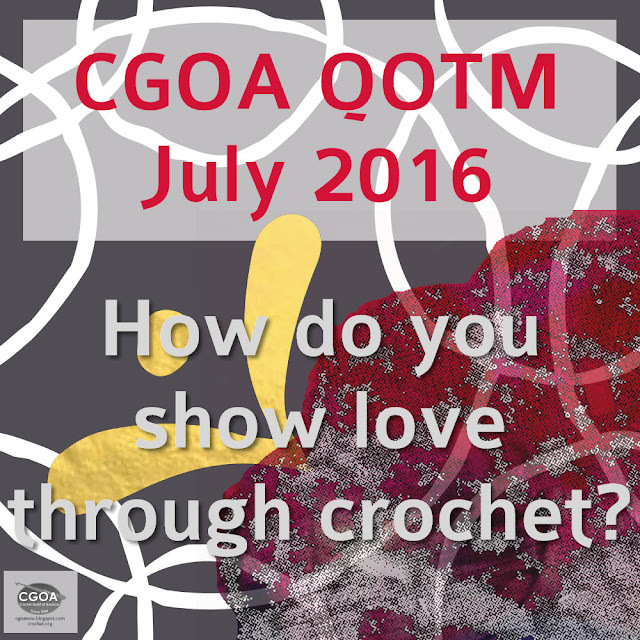 June's QOTM: How often do you use the yarn suggested in the pattern? I mostly use what I have since I have bought quite a few different types of yarn. I pay attention to the weight listed on the label and use the same weight as recommended. If I decide to use a heavier yarn, I will make a swatch to see how it's going to look and act. I almost never use the yarn suggested. I can't always find it at my LYS, or it's a yarn I don't care for. And I've almost always got something in my stash that will work. Since I'm changing yarns, though, I always swatch. I'm sometimes surprised by what works and what doesn't. HooliganHooker showed us her stash with a comment we could visualize! I have 6 20-gallon tupperware type boxes filled to the brim with yarn and then some, so I very rarely use the suggested yarn unless I happen to have it handy. I do always try to get the best match to fibre and weight though! I am fairly certain that our group can relate to these three ladies. I have quite the stash going myself. Love heals, so let's keep the conversation going. How do you use crochet to show love? Please leave a comment here on the blog, or on the CGOA facebook page! Do you want to connect on social media? I can be found on facebook, Instagram, and SnapChat (It's fun!). Join my newsletter about crafts, crochet, and education.